No 3D? Also No Problem!. Go to the shop now!!. 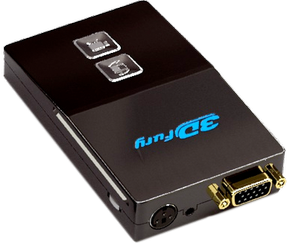 HDfury3 is the world’s most powerful HDCP deciphering converter ever built! Introducing new features such as two HDMI 1.3 inputs with Deep Colour(TM) support and auto/manual switching, 5.1 Dolby Digital/DTS sound, perfect image centering in both component and RGB modes, output resolution limiting, and user customizable options via DIP switches! Dr HDMI can help to solve most HDMI issues such as handshaking issue, compatibility issue and/or any EDID related issue. 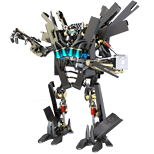 It help to keep a source always ON or tricked into a defined state which is especially useful for system integrators. Dr HDMI can also boost signal integrity and extend +5v signal through a HDMI/DVI-D chain. For example, it can work hands in hands with HDfury products such as Gamer Edition to extend compatibility range. It can also be used to limit the source output resolution. Dr HDMI acts as an EDID manager, HDMI/DVI-D emulator and repeater that comes with pre-defined presets, user programmable banks, Sink EDID sniffing bank and more ! HDfury have a tremendous success worldwide helping people to connect brand new HDMI sources to technically able analog displays. HDfury devotion to help granting new possibilities with your existing analog display has inspired us to create a fresh new edition accessible to the rest of us! 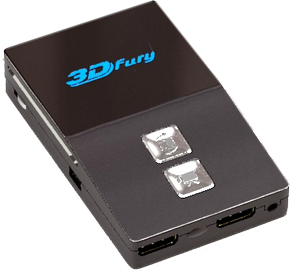 The global phenomenon that is HDfury is now available in a brand new shape: The Gamer2 that comes in either Component(YPrBr) or VGA(RGBHV) Edition ! 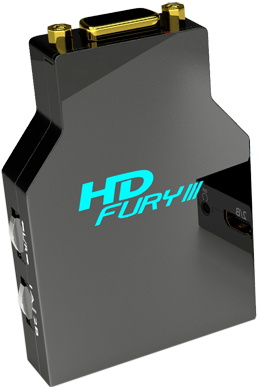 HDfury Gamer2 Edition is a straight HDMI to VGA or component cable that includes an embedded HDfury2 module and offer sound output and external power supply connector so it can be used on any HDMI sources.